I have done a lot of research last night and today about assistive technology, braille displays, and screen readers. I found that a very important part of making technology accessible is insuring that everyone can access your information. I know this seems obvious, however there are several parts that are a little tricky. First I found a site that will do a color blind analysis of your webpage. This will allow you to check that your color scheme works for people with color blindness and that if people have special settings in their web browser to override website colors your site plays well with them. I am proud to say my site currently passes these tests and am including information about it in my site footer. The other area is how your site appears in text only browsers. This directly affects screen readers and the ability to read your site via voice synthesis or Braille displays. The Web Content Accessibility Guidelines (WCAG) outline this as well as general accessibility requirements. 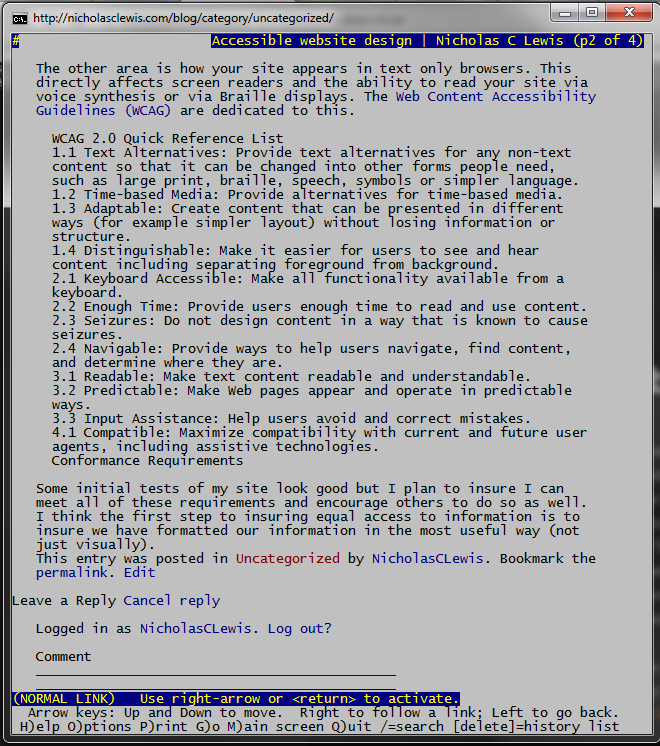 One tool to help evaluate your sites accessibility is a text-only browser, such as lynx. Here is a picture of this page as seen in lynx. The initial tests of my site look good but I plan to insure I can meet as many of the WCAG requirements as I can and encourage others to do so as well. I think the first step to insuring equal access to information is to insure we have formatted our information in the most useful way, not just visually.